A WWE title will be defended on another promotion's show during WrestleMania weekend. 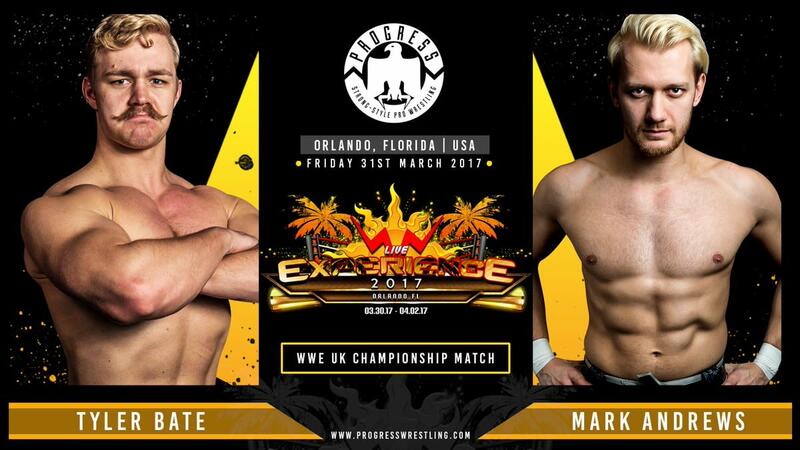 PROGRESS Wrestling co-owner Glen Joseph announced on Facebook Live today that Tyler Bate would put his WWE United Kingdom Championship up for grabs against Mark Andrews on March 31st at PROGRESS: Orlando. The match is based on an angle where Bate and Trent Seven previously interfered to help Pete Dunne retain the PROGRESS title over Andrews. Joseph read a letter that was supposedly from William Regal referencing the interference and announcing that Bate vs. Andrews would now be for the title. The UK title match won't be the only collaboration between WWE and PROGRESS in Orlando, with PROGRESS wrestlers also featuring in matches at WrestleMania Axxess. PROGRESS: Orlando will be part of WWN Live's week of events in Florida and will take place on Friday at 12 p.m. ET. It will be available as a live iPPV on WWNLive.com and the matches involving wrestlers under contract with WWE will air on the stream.